I find reflections of all kinds very interesting. Buildings that reflect each other creating a symphony of sight. Trees or boats reflected on the water, make our hearts sing. This was inspired by the reflections on the water as seen in Hong Kong harbour. How many roads do we have to travel until we find our way? So many options, so many choices. At times, the road leads nowhere. At other times, it leads to success, or maybe to failure. But, the paths have to be walked or, as the poet says, "there is no road, we make it as we walk". 2009. Cotton, dyed and painted, pieced. 38 x 45 in. 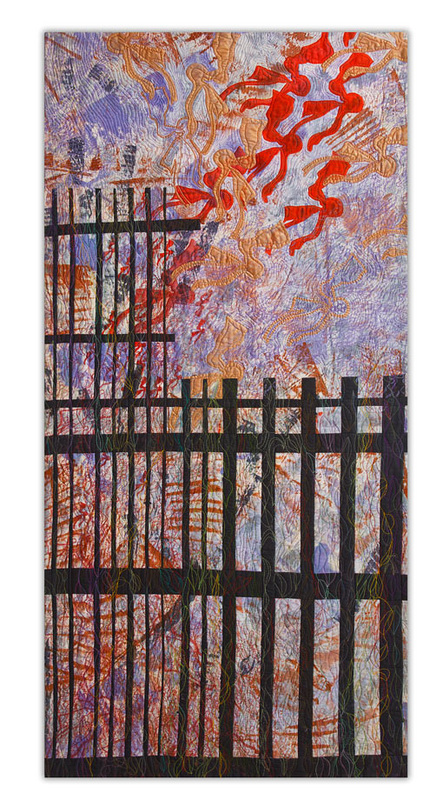 This quilt was inspired by a very large forest fire in Australia. For those of us watching it on the television, the view from the air was that of smoke and burnt land. I cannot even imagine how those near it felt as they saw the fire approaching and had to abandon their homes. Another quilt inspired by the rust that seems to cover so many things around the coast where I live. In the autumn, even the trees seem rusted. The stimulus for this work was a visit to a local cemetery, where I was fascinated by the gates and the thoughts that such places provoke..